How is Technology Shaping the Future of our High Streets? Digital technology is killing high street shopping – or is it? If Amazon is investing in bricks and mortar stores, it’s a sign that the high street still has a place in our shopping future. 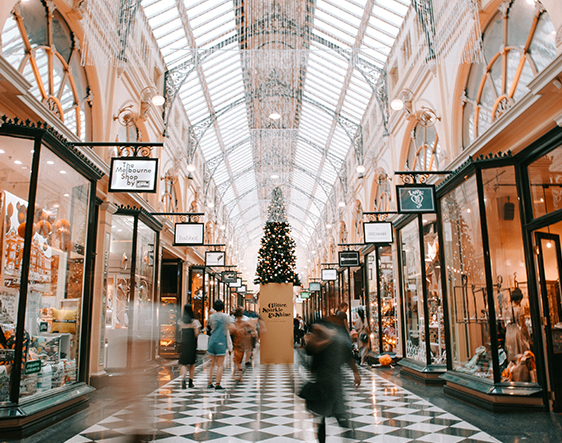 Modern consumers want not just the best of both on and offline worlds, but the best of all worlds – convenience, choice, and a diverse range of shops and businesses. Contributor Daniel Whytock – Down Your High Street. As grim as things appear to be on the UK high street today, it doesn’t mean there is no way back. Omni-channel retail that seamlessly integrates digital technology is the key to high street survival. But retail tech is moving so quickly that if high street retailers don’t move fast, they will get left behind. This can often leave many high street businesses feeling that the future is a closed shop for them; particularly smaller independent retailers who cannot afford to take the same risks as larger brands. The technological future of the high street will not just be about large companies with expensive robot devices and AI – it is rooted in a change of approach and understanding, in low-cost technology and data, and a unified approach to online and offline high street shopping. Retailers of all size will already have databases, spreadsheets, social media page analytics, customer service call logs and emails – the challenge lies in unifying data silos. New technology is giving a more complete picture of customers’ (and potential customers’) behaviour, meaning we can track patterns and understand how behaviours are evolving. There are already legacy data management solutions and customer data platforms (CDPs) available to retailers to unify the data and make it available to users in a way that is easily digestible. While these tools are usually adopted by larger retailers with IT teams, there are cloud providers offering CDPs that can work for smaller businesses. And it doesn’t stop there. The advance of the Internet of Things (IoT) will give easier and deeper insight into products and customer behaviour. For example, shelves and storage units that can tell us how often products are picked up/viewed and put down again will help establish the products that are drawing interest but are not being purchased due to cost or lack of further information. As with the notion that internet shopping is replacing high street, we also hear how robots will eventually replace people in customer service. This is unlikely to be the case. Robotics will certainly take over some roles in the retail industry, but this will only serve to enable more quality interaction with customers. AI and Robotic devices can help customer service staff be more responsive to customers, by freeing them from the less interactive aspects of their roles. In store robotics are already able to scan store for pricing corrections and tidy up shelves and floors, freeing-up sales staff to concentrate on the customer interaction and experience in order to make a sale. Much like robotic household devices such as the Roomba vacuum cleaner, these robot store assistants are likely to become more commonplace in shops of all sizes as the technology advances and becomes more accessible. Robots will transform warehouses. As we are beginning to see in large e-commerce storage spaces owned by Alibaba and Amazon, robotic arms and interconnected automated conveyor belts can pack and sort hundreds of goods for deliveries at high speed. Employment in high street retail warehouses will be transformed from often dangerous low skill work to highly technical skill requirements for maintenance and monitoring of technology – entry level retail training is going to look very different in years to come. Government and large corporations realise the value of keeping the high street alive in the digital age, and are investing in more initiatives to support the UK high street and ensure that a diverse range of business can continue to open and thrive across the country. And, for all the blame that online marketplaces can take for the demise of the high street, their forward thinking and entrepreneurial spirit have gone some way to reducing the barriers for retailers to help grow their digital arm and feed in store sales. As taxes for online-only sellers are imposed, they lose their cost advantage over bricks and mortar sellers, making it easier for high street shops to compete. More specialised marketplaces created for bricks and mortar independents offer incentives and technical support tailored to their needs. Overall, the high street of the future will look very different, but technology is driving a return to its roots – individual customer service and an experience to remember.